Progressions Director Julie Rinard periodically shares her student interactions with us, as part of the San Jose Jazz blog. In this update, she summarizes the vision behind Progressions, and shares the newly-kindled musical interest of one of her new students, Francisco. Many of the kids we work with come from unspeakably grim home environments and have shared difficult life stories that most of us would not allow ourselves to fully imagine. Amidst these challenges, many of the students have developed a resiliency that makes them wise beyond their years. Resiliency is resiliency. But at the end of the day, these are still children who want a chance to be children, to make friends, to be in a positive learning environment, to have a life dream, and a shot at turning it into reality one day. Progressions is a vehicle for helping make this happen. It is our hope that Dulce, who wants to be a professional singer when she grows up, can experience a sense of vocal mastery in the coming years as a result of her participation in Progressions, and that having that sense of accomplishment can help give her the strength to graduate from high school and go on to college. We could tell lots of stories about Progressions kids. We could talk about Jorge and the day he told me (program director) he couldn’t bring his father to Family Night because he was dead, or Pedro and the day he came to me with hunger pangs because his mom couldn’t find anything for him to eat at home. Or I could talk about Lalo, who was out of school for a week and then came back with a gash on his throat that he refused to discuss. Not too long ago, Progressions was awarded a grant that allowed us to purchase a dozen keyboards. I brought one of the keyboards to school the next day and played Schumann’s “Wild Rider.” At the end of class, I noticed Francisco hanging around. As I began to put my things away, he asked if I could help him find middle C. The next day when I came to class without the piano, he asked why I hadn’t brought it. The next day I brought the keyboard back, and he asked if I could teach him a song. Francisco knows about middle C because his older cousin taught him about it once when Francisco’s cousin was in town for a visit. Francisco clearly has a strong desire to learn to play the piano. Yet in his current life situation, piano lessons are out of the question. Progressions provides him with access to an opportunity he would not otherwise have. You can learn more about Julie’s work with Progressions by visiting our Progressions page. 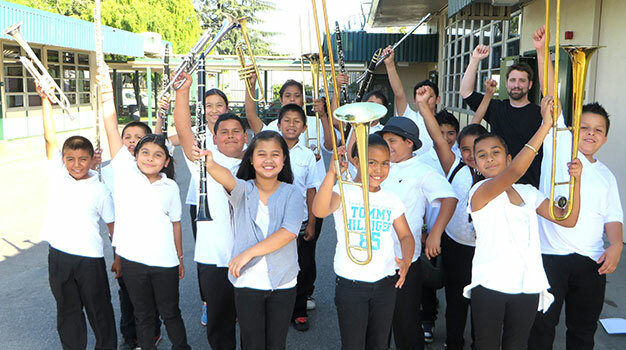 Additionally, we’re accepting instrument donations to expand our work into more area schools. To donate, please email instruments@sanjosejazz.org or visit our donation page for more info.